So a few things of note this turn. First marked item is a dire portent, it means that someone has cast a global ritual. Globals tend to be big spells that affect the entire world, provide large quantities of gem income, or do other stuff. We've mentioned a few before, like Astral Corruption. One of the restrictions on global spells is that only 5 can be up at any one time between all of the nations in a game. They can provide a fairly significant power boost to the nations that can claim them. The second (two) items are seduction attempts. One of the things that Arco's Oreiads can do. The way seduction works is that it rolls two checks against morale and magic resistance, if you win both rolls then the commander joins your side. If you fail either of the rolls though you enter an assassination battle, which is still quite good if you can kill the commander. Oreiads are quite good mage-thugs one on one, so it's a fairly powerful tool of theirs. Either free commanders/mages or probably a dead one. However you have to be willing to put your Oreiads in potentially harms way to do this. One particular problem is that sneaking units can be patrolled out, so you risk your cap only mages being killed when they're discovered in a province and try to solo an entire army. The last thing is that there was a battle in Giant's Rest, the province southeast of Arco's capital that has flipped hands multiple times this game. It means he probably moved his army out on the offensive again. One of the seduction attempts fail, so Arco got an assassination battle. I'm not quite sure whether this is scripting or the mage being off script. Either way the casting isn't a bad set up. The Oreiad casts phantasmal warrior x 2 to create distractions, then eagle eyes to be more accurate, followed by a lightning bolt to kill my commander. If a seduction attempt was successful all you get is this message. 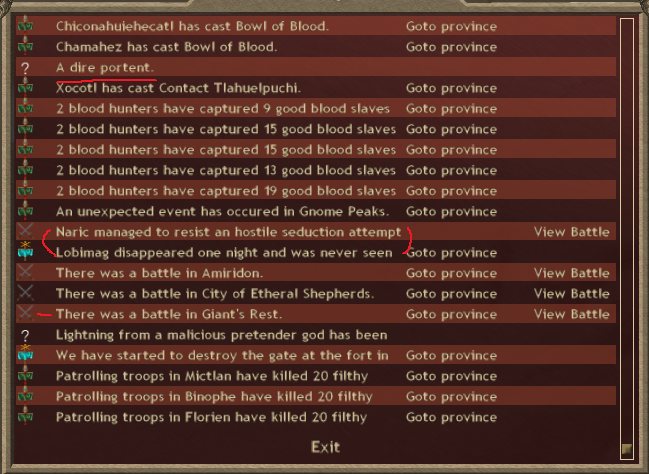 It was another independent commander that Arco stole, but it also means none of my units that were in the province move. This is the battle in Giant's Rest. This was my concern with the battle a few turns ago. Arco recovered and grew his mage force from that fight in two(?) turns, and by comparison I still haven't fully recruited back all the units I've lost. This is the message I received from a global spell being cast. This particular message is tied to the spell "The Wrath of God." 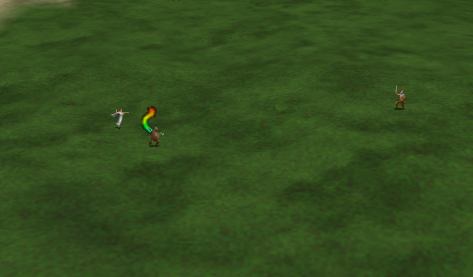 It's a spell that hits randomly selected enemy units with lightning bolts every round, anywhere across the globe. It's more powerful and more likely to strike in friendly dominion though. If you're not in the player's dominion its almost entirely negligible. Even in friendly dominion though it's not extremely powerful. 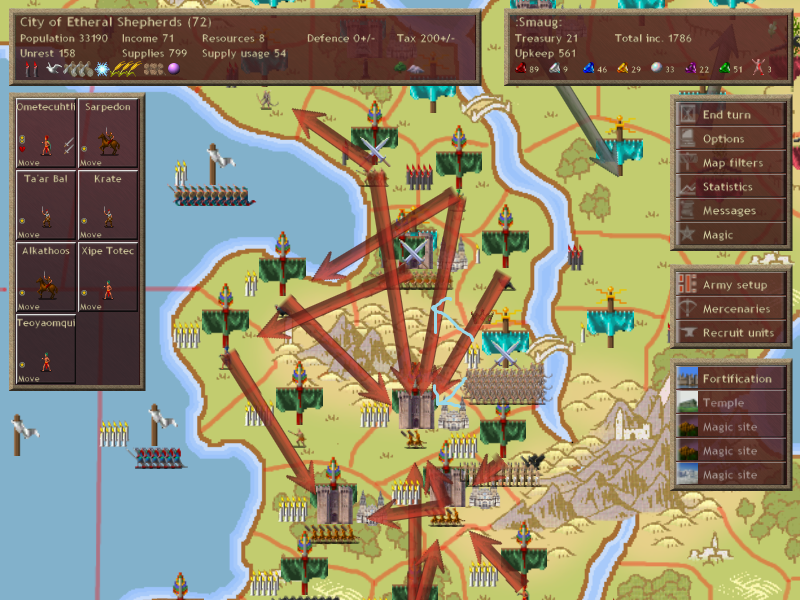 I had a total of 14 guys across my empire hit this turn, seven of them were killed. 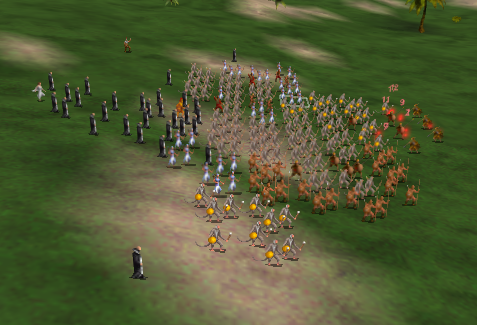 This was when my army was sitting on top of hostile dominion in Arco's capital. It's unfortunately fairly weak without having the ability to really push dominion into enemy territory. Unfortunately for Arco he borders two nations that are blood sacrificing, so it's worse than normal. So I took Arco's capital with my army stack while he simultaneously moved out. It means that he has competing objectives to go deal with, luckily. His capital has about 160 unrest though so even if he takes it back he won't be able to recruit from it, and the gold income from it with all that unrest isn't too great. So it's a possibility he will ignore his capital entirely and just move on to try and siege down my relatively undefended fortress. 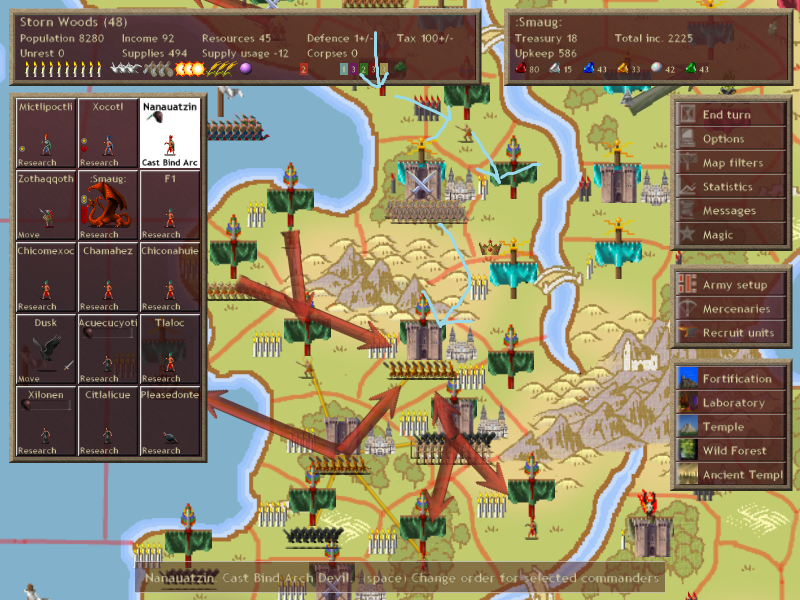 Since I can't hold his capital even if I keep my army back there I decide to start moving everything back to defend my territory. So I got this message this turn, it's actually a different kind of seduction. There are sirens in the game, they're one of the mages of MA Oceania, an underwater nation. However, there is also a random event where you can get one. Apparently Arco got that event and is now using it to lure my commanders into the sea. Sirens don't really seduce commanders though. What they really do is sing their song, and if the commander fails their checks they march themselves into the water and proceed to drown themselves. 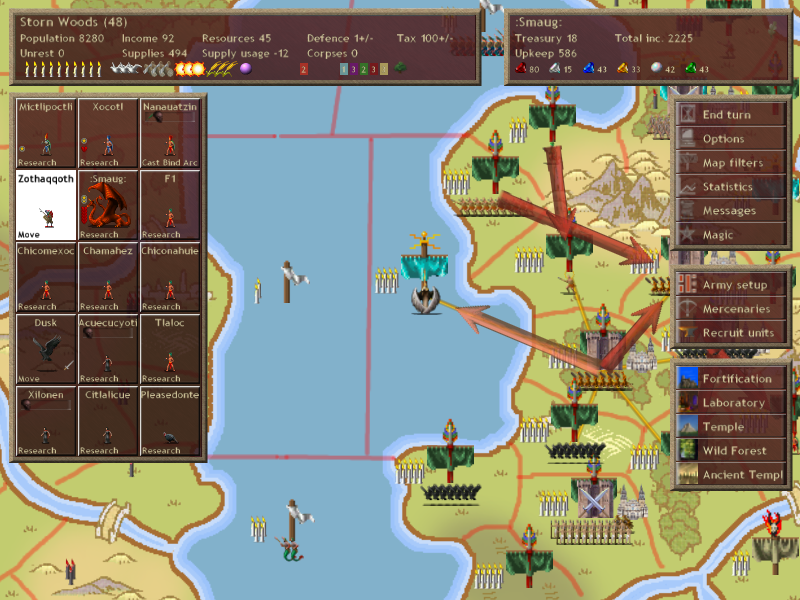 If the commander is amphibious though a battle occurs in the province (solo commander v everyone in the province). Arco actually sent Rainbow Dash underwater. Dexanth probably equipped her with a water breathing ring and is just trying to swipe up the provinces for their extra gold/gems. However, the basic problem with all land nations trying to go underwater is you can't recruit PD. I'm taking advantage of that here by sending my icythid commander I recruited a while ago to go for a swim and take the province unopposed. Also I'm expecting Dexanth to push back against me now that he has his capital, so I start funneling my forces into my northernmost fort. I don't expect him to bother using the army he has on his capital to take back the surrounding provinces since he has a smaller stack of troops in his northern fort that can do that. Also, my highlighted commander in the province is casting Bind Arch Devil. 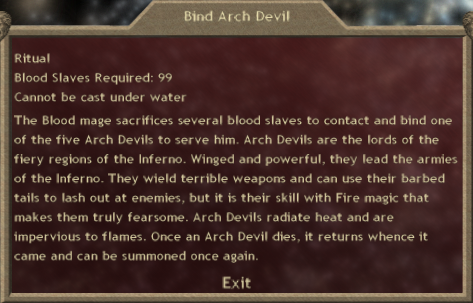 I'm not really impressed with Archdevils as thugs (or really any of the other blood uniques for that matter). However, almost every archdevil that exists has F4 (one of them has S3F3, but I think there are four maybe five others and they all have F4). I'm hoping to get one of the guys with F4 because they are capable of summoning Zmey, pretty much the best summon in existence.